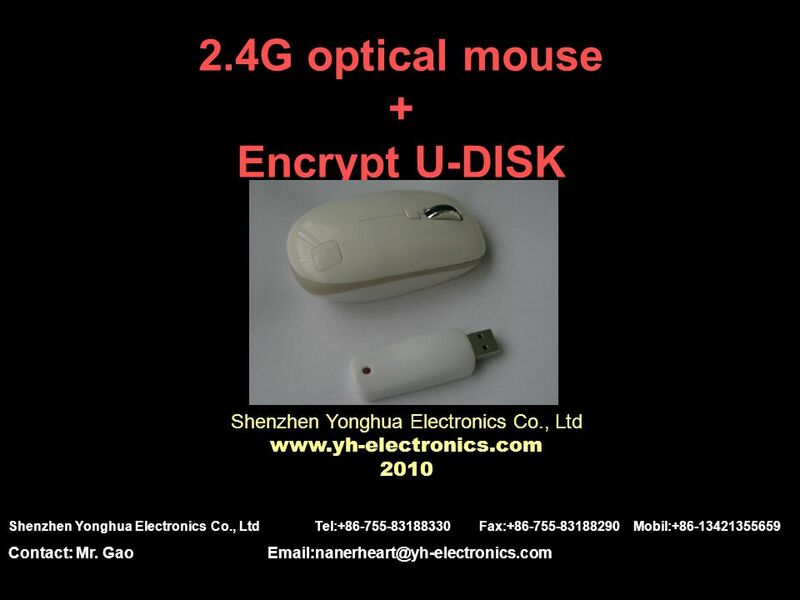 2.4G optical mouse + Encrypt U-DISK Shenzhen Yonghua Electronics Co., Ltd www.yh-electronics.com 2010 Shenzhen Yonghua Electronics Co., Ltd Tel:+86-755-83188330. 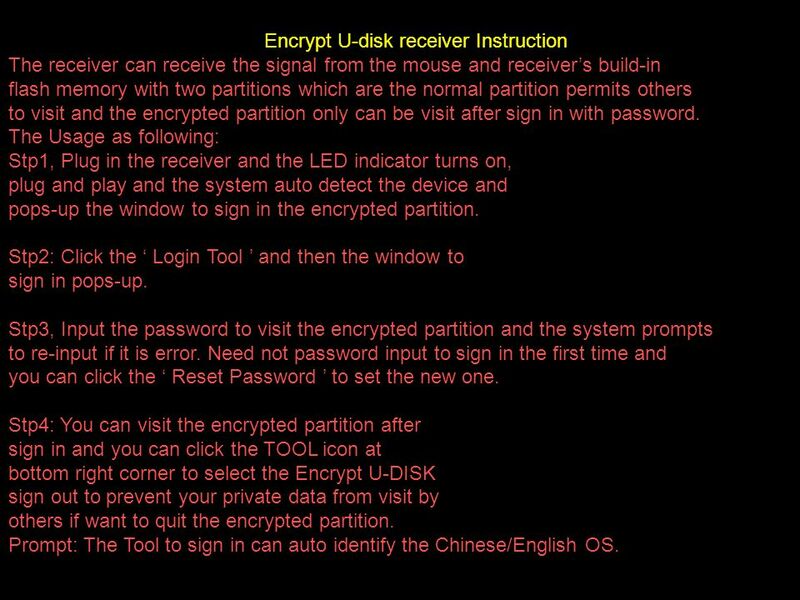 5 Encrypt U-disk receiver Instruction The receiver can receive the signal from the mouse and receivers build-in flash memory with two partitions which are the normal partition permits others to visit and the encrypted partition only can be visit after sign in with password. 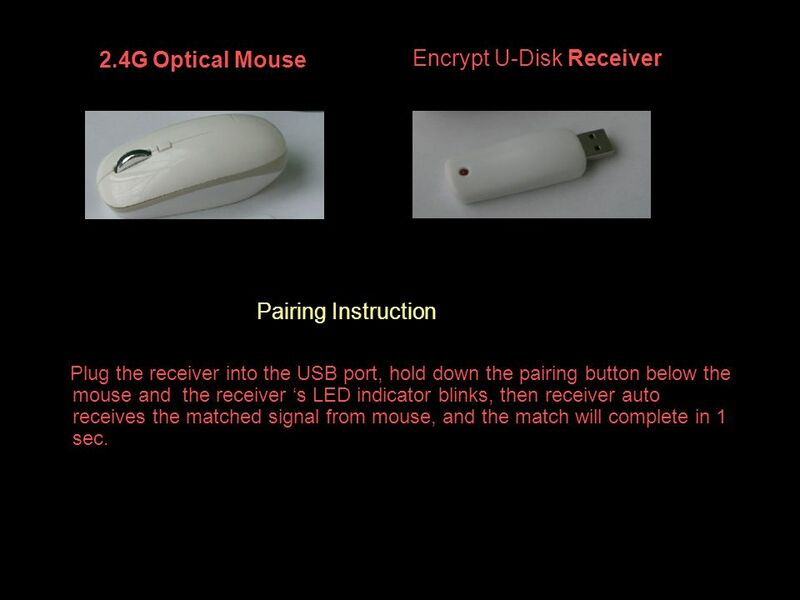 The Usage as following: Stp1, Plug in the receiver and the LED indicator turns on, plug and play and the system auto detect the device and pops-up the window to sign in the encrypted partition. Stp2: Click the Login Tool and then the window to sign in pops-up. Stp3, Input the password to visit the encrypted partition and the system prompts to re-input if it is error. Need not password input to sign in the first time and you can click the Reset Password to set the new one. Stp4: You can visit the encrypted partition after sign in and you can click the TOOL icon at bottom right corner to select the Encrypt U-DISK sign out to prevent your private data from visit by others if want to quit the encrypted partition. 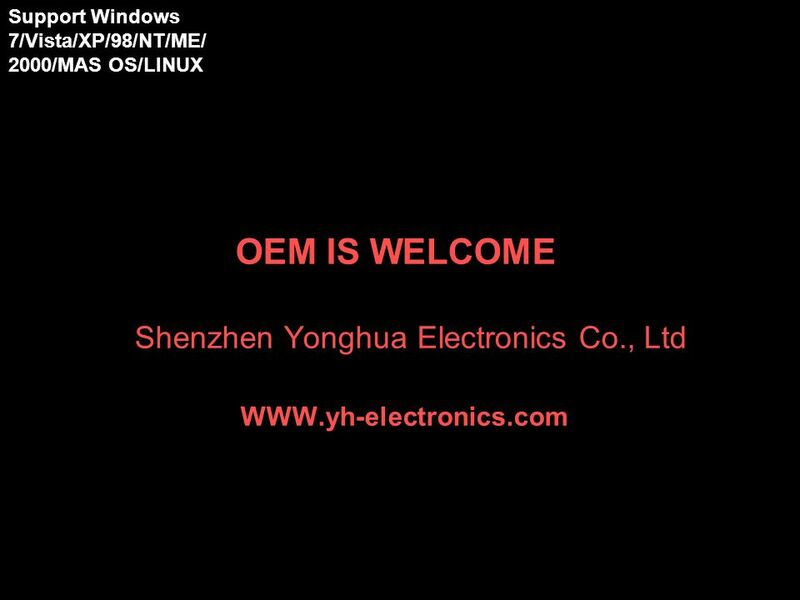 Prompt: The Tool to sign in can auto identify the Chinese/English OS. 6 The encryption function of U-DISK receiver U-DISK receiver supports encryption function. 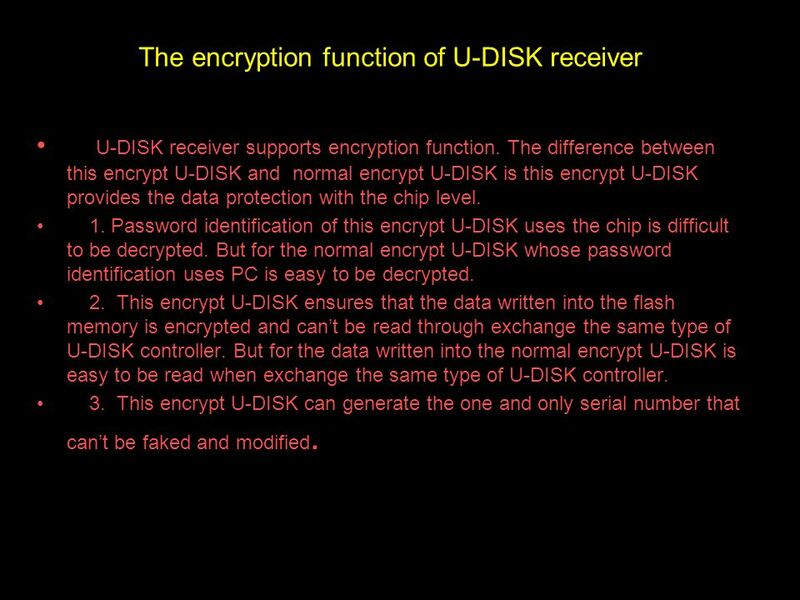 The difference between this encrypt U-DISK and normal encrypt U-DISK is this encrypt U-DISK provides the data protection with the chip level. 1. Password identification of this encrypt U-DISK uses the chip is difficult to be decrypted. But for the normal encrypt U-DISK whose password identification uses PC is easy to be decrypted. 2. 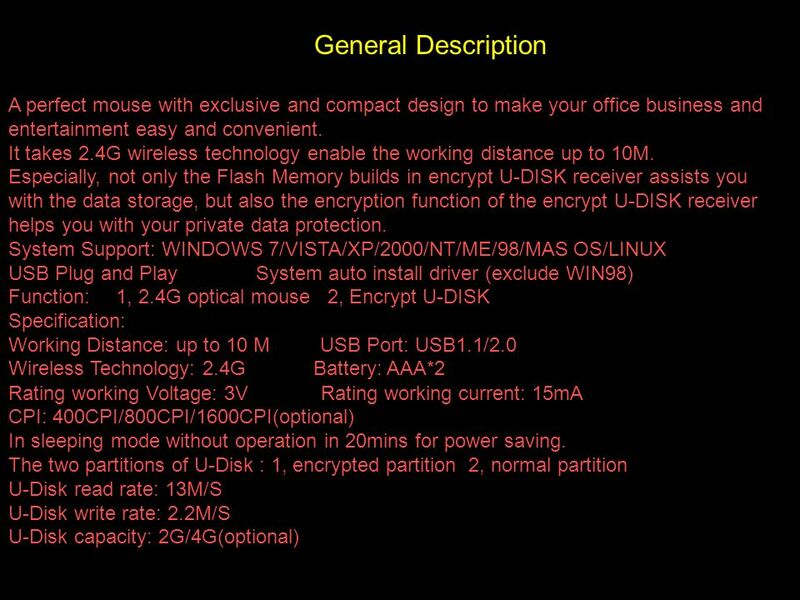 This encrypt U-DISK ensures that the data written into the flash memory is encrypted and cant be read through exchange the same type of U-DISK controller. But for the data written into the normal encrypt U-DISK is easy to be read when exchange the same type of U-DISK controller. 3. This encrypt U-DISK can generate the one and only serial number that cant be faked and modified. 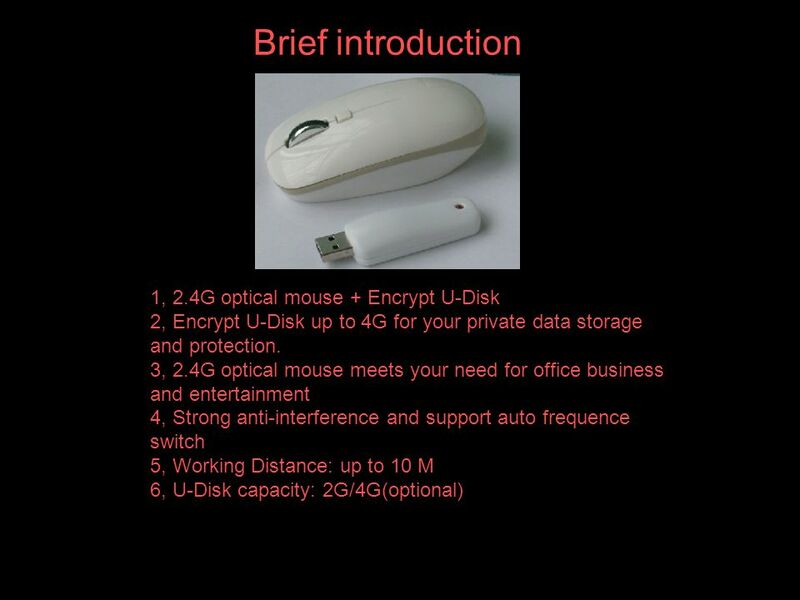 Download ppt "2.4G optical mouse + Encrypt U-DISK Shenzhen Yonghua Electronics Co., Ltd www.yh-electronics.com 2010 Shenzhen Yonghua Electronics Co., Ltd Tel:+86-755-83188330." AD-1 Auto Scanner Configuration Software Diagnose FAQ Features. 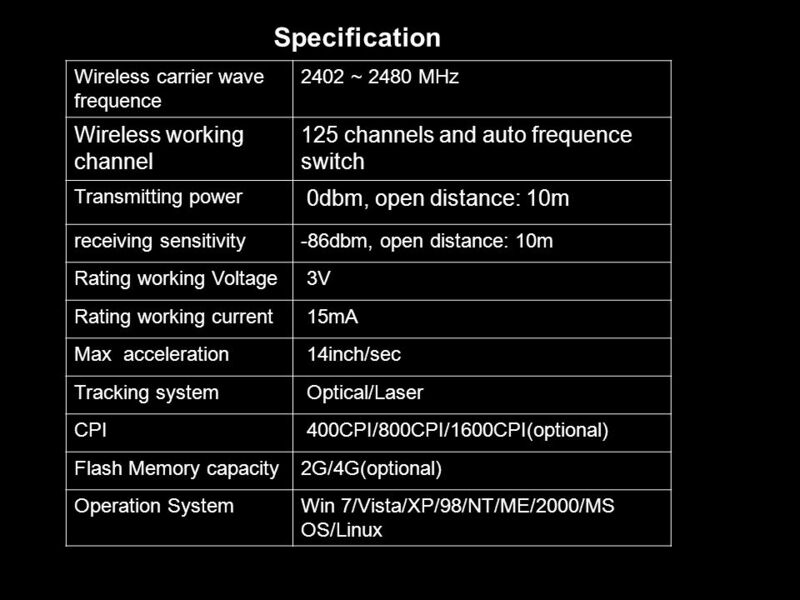 Thank you for choosing HUAWEI E560 Wireless Modem (hereinafter referred to as the E5). z The supported functions and actual appearance are subject. Computer As Personal Storage. Mass Storage We are people who have massive amounts of things to store. We need more room, more closets, more garages, more. QUICK GUIDE MANUAL GV-DVR System Organization 2. Specification. 32-bit 66/33MHz PCI Gigabit Ethernet Adapter User ’ s Manual. Global Security USG-251 GPS Mobile Personal Tracking Kit.